delivers Nano size CoQ10 particles to cells throughout the body! DOUBLE STRENGTH LiQ-10™ Syrup, the Liposomal CoQ10, is a 100% Hydrosoluble™ and 100% vegetarian formula using Li-Q-Sorb™ Coenzyme Q10 that has been formulated to “ride” inside microscopic bubbles of lecithin called liposomes. Each serving size (5ml) of DOUBLE STRENGTH LiQ-10™ Syrup delivers 100mg of Hydrosoluble™ CoQ10 and has less than 1g of fat as medium chain triglycerides and lecithin. This revolutionary Liposomal delivery system is used to deliver nano size CoQ10 particles to cells throughout the body. Not only does it get into your blood stream faster and more efficiently but you can get it into your body easier. 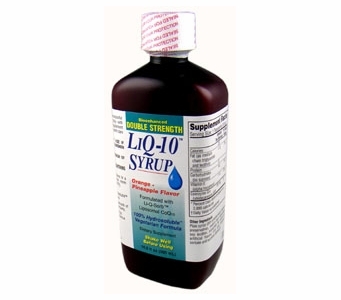 DOUBLE STRENGTH LiQ-10™ Syrup, the Liposomal CoQ10, can be taken by the spoonful or mixed with a beverage for ease of administration. Liq-10®, and Li-Q-Sorb® are registered trademarks of Tishcon Corp.
Hydrosoluble™ is a trademark of Tishcon Corp.